Its summer vacation time and Yuuta and the rest have agreed to join Rikka on her trip to visit her grandparents. During the course of the trip, Yuuta notices that Rikka has been acting quite out of the ordinary, being far quieter than usual. It is not long until Yuuta learns of Rikka’s life in her past home, including her grandfather disapproval of her Chynebu tendencies and of how her father succumb to illness three years prior. The episode very briefly dips into a typical beach episode but thankfully regains its focus relatively quickly. We learn that Rikka has denied the fact of her fathers passing and refuses to go to his gravesite. In an attempt to help her, Yuuta assists Rikka in escaping from her grandparent’s house and fleeing to her old house where she lived with her parents. It takes some time but the pair eventually reaches Rikka’s old house, only to discover that the house was demolished and the lot now stands empty. It is not long, however, until Toka catches up to the pair determined to get Rikka to realise the reality of their situation. This is the episode where this show gets serious, really delving into the trauma that leads to Rikka developing her chunibyo personality. This adds a great deal to Rikkas character and allows us the viewer to have a much deeper understanding of her personality, especially the nature of her home life and how her family views her. 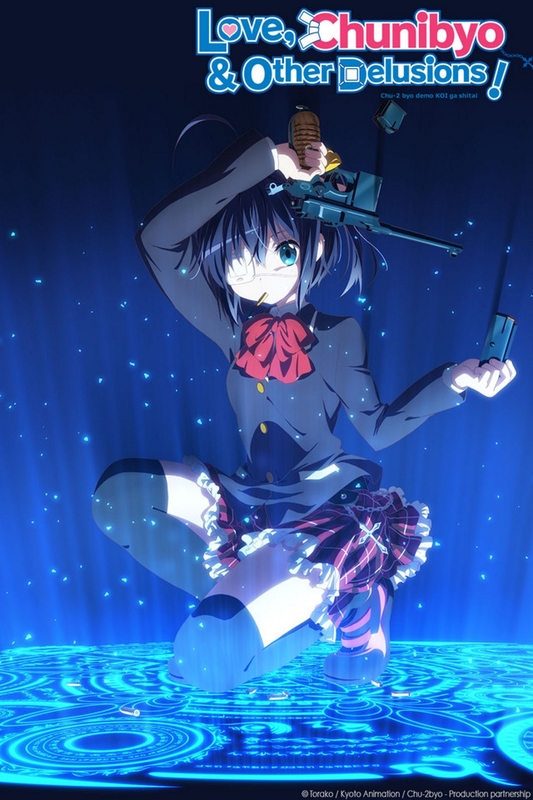 Continuing right after the events of the previous episode Toka is trying her best to force Rikka to come to terms with the fact that their old house is gone and their father is dead. At this point Rikka runs away again, meaning that Yuuta must chase her down. He runs all over the area searching both the grandparent’s house and the beach (where he finds his friends lighting of sprinklers). In a last-ditch effort, Yuuta runs to the trains satiation where he finds Rikka on the train headed home, Just making it aboard in time to get to RIkka. The two decide to stay on the homeward bound train, along the way Yuuta describes what resulted in him developing his chunibyo personality. After arriving home Rikka discovers that she has forgotten the key to her apartment, so Yuuta offers her to stay at his for the night. He soon discovers that his own family is away for the night, so we all know what that means. The two decide to go to the convenience store to buy some food, as the night passes Yuuta feels himself falling for Rikka, but while he tries to ignore those feelings, it seems Rikka may be feeling the same way about him. Much like the last episode, there is a great deal of character development but this time there is much more of a focus on the growing bonds between Yuuta and Rikka. I thought that the time spent eating food was a particularly endearing scene, Not to mention the connection established during their train ride back to the city. Knowing whats soon to happen, It’s easy to say that this is clearly the calm before the storm.